A black, white & red badge reading save our NHS. 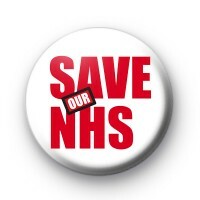 If you are against the deep cuts & privatisation of our beloved NHS, show your support with a Save Our NHS badge. The NHS is a vital part of being British & universal health care is something we need to protect. Standard 25mm button badge hand made in our UK workshop.